Select the desired type of alerting systems below. Not sure what to get? Use Advanced Search (in English) or check out this Tutorial/Quick Guide. Signaling systems, or simply signalers, are designed to help notify you of different events, such as the phone/videophone ringing, the doorbell, a baby's cry, motion, weather alerts, smoke alarms, or carbon monoxide detectors. Also known as alerting or notification systems, these devices can alert you to different events through flashing lights, loud audible alarms, and/or vibration. Which event do you want to be notified of? You will need to purchase one transmitter for each event you would like to be notified of. Each transmitter is designed to alert you for a specific event; however, some transmitters do work for more than one event, such as a door and phone transmitter. For example, if you want to be alerted when your phone rings and when baby is crying, you would purchase one phone transmitter and one baby cry transmitter. How many rooms do you want to be notified in? For each room you want to be notified in, you will need to purchase a receiver. For example, if you wanted to be alerted in the bedroom, living room, and kitchen, you should purchase three receivers. Some brands also have portable receivers (such as pagers and watches) that you can bring with you wherever you go in your home. Each receiver will work with all your transmitters, as long as they are the same brand. To ensure compatibility we suggest purchasing the same brand of signaling components. Don't mix apples with oranges! For example, if you already own a Sonic Boom SB1000ss alarm clock, buy signalers made by Sonic Alert. 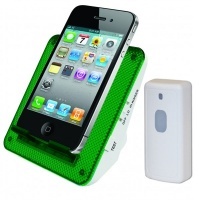 This technology sends a signal from your transmitters to your receivers through radio waves. It is ideal for both home use and for people who live in apartments, dorms, or other types of public housing because built-in dip switches can be adjusted to ensure your system will not interfere with a neighboring system. The following brands are radio frequency: Bellman & Symfon, Clarity/Ameriphone, and Silent Call. This technology sends a signal from your transmitters to your receivers through your home's electrical circuits. There is not any specific information about this technology that you need to be aware of. Sonic Alert uses line carrier technology. Why are signalers so important? Signaling systems not only allow deaf and hard-of-hearing people become more independent, they may also save lives. Watch the video to your right and see why alerting devices are so important! At Assistech we carry a wide range of visual, vibrating, and audio signalers for the deaf and the hearing impaired, including the newest T3—or Temporal 3—smoke detector technology. Use the Quick Guide below or consult our Product Wizard to find the right alerting device(s) for you! This combination set from Smart Caregiver consists of one FallGuard Safety Auto-Reset Monitor (TL-2100S) and one Silver Lining Bed Sensor Pad 10-in. x 30-in. (PPB-RI). Used together, they provide a reliable means for caregivers to be alerted if a patient gets out of bed or gets up from a chair. Automatically resets after pressure is applied to a connected sensor pad! The FallGuard Safety Auto-Reset Monitor is a fall prevention monitor that can be placed at the bedside or wheelchair, connected to a corded sensor pad. When the resident gets up and pressure is removed from the pad, the monitor will sound alerting the caregiver. If the pressure is re-applied to the pad, the monitor will automatically reset. The TL-2100S FallGuard Safety Auto-Reset Fall Monitor alarm works with Smart Caregiver standard bed sensor pads, chair sensor pads, floor mat sensors, and early warning seat belts. No more broken cords! This Bed Alarm Sensor Pad has a replaceable SafeTRelease that separates instead of breaking or pulling cord away from pad, providing greater safety with less tripping risk and reducing the need to buy new sensor pads due to cord damage. 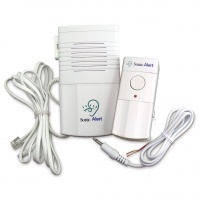 Bed Alarm Sensor Pads by Smart Caregiver are placed under the resident on the bed. When resident gets up and pressure is released from the pad the monitor will be activated and alert the caregiver (Monitor required, not included). The PPB-RI Bed Alarm Sensor Pad offers caregivers an efficient method of knowing when a resident is getting out of a bed. Bed Alarm Sensor Pads from Smart Caregiver are compatible with all Smart Caregiver fall prevention monitors and systems. These Bed sensor pads are totally sealed and impervious to fluids. They are made with silver membrane technology to assure a long reliable life. These weight-sensitive pressure pads are for bed fall alarm monitor use. When connected to a fall prevention monitor, the pressure pad will trigger the fall alarm when weight is removed from the pressure pad itself. This pressure pad provides incontinence protection. IMPORTANT NOTE: Non-Returnable. For health and sanitary reasons, we cannot accept returns on this item. Chair Sensor Pad measures 10-in. x 15-in. This combination set from Smart Caregiver consists of one FallGuard Safety Auto-Reset Monitor (TL-2100S) and one Silver Lining Chair Sensor Pad 10-in. x 15-in. , Coiled Cord (PPC-WI). Used together, they provide a reliable means for caregivers to be alerted if a patient gets out of bed or gets up from a chair. 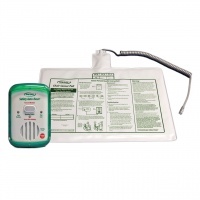 Chair Sensor Pad Alarms alert a caregiver whenever pressure is removed from the sensor pad. When the resident is getting up, the pressure of the pad is removed and the alarm on the fall monitor will sound. The PPC-WI Sensor Pad by Smart Caregiver has set-up instructions printed right on the pad. There is also a spot for recording the initial date of use. Bed and Chair Pads are easy to clean. This alerting system for the hardof hearing is everything you need to get alerts of incoming landline, cell phone, Skype and FaceTime calls and text messages, as well as wireless doorbell rings. One year manufacturer's limited warranty. ABOUT THE COMPONENTS: 1. CentralAlert Cell Phone Ringer/Flasher (Model CA-CX) The CA-CX alerting system uses a loud ringer and bright flasher to alert you to incoming landline, cell phone, Skype and FaceTime calls and text (SMS) messages. And with a bed shaker connected, you will never miss a call again, even while you sleep. Bed Alarm Sensor Pads offer caregivers an efficient method of knowing when a resident is getting out of a bed. Bed Alarm Sensor Pads from Smart Caregiver are compatible with all Smart Caregiver fall prevention monitors and systems. When using a GBT-RI Wireless CordLess Bed Alarm Sensor Pad with a Wireless CordLess Monitor you are able to remove the alarm noise from the room creating a quiet in-room environment for the resident. Pad is placed under resident on the bed. When resident gets up from pad, a wireless signal is sent to the monitor setting off an alarm to alert caregiver. These Bed sensor pads are totally sealed and impervious to fluids. They are made with silver membrane technology to assure a long, reliable life. These weight-sensitive pressure pads are for bed fall alarm monitor use. When connected to a fall prevention monitor, the pressure pad will trigger the fall alarm when weight is removed from the pressure pad itself. 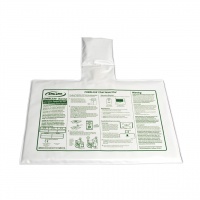 This pressure pad provides incontinence protection. 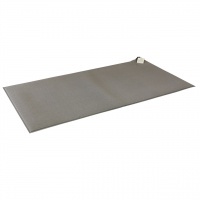 Long Gray Floor Mat measures 24-in. x 48-in. 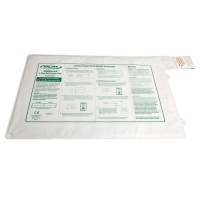 Cordless Long Floor Mat for TL-2100G FallGuard Cordless Monitor 24-in. x 48-in. The state-of-the-art DB200 alerting system is the only doorbell signaler that requires no wires and can be installed in seconds. Unlike competing models, the DB200 alerting system is not triggered by sound, so annoying false alarms are a thing of the past. 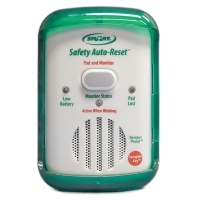 Other advanced features of this alerting device include: selectable number of flashes (5 or 10), different flash code for front and rear doors and a built-in chime for hearing members of the family (can be turned off). The DB200 has a built-in outlet to flash an attached lamp and each sends a signal to all Sonic Alert remote receivers. The DB200 has the additional feature of being a telephone signaler. Just plug the phone cord into a modular telephone jack. Its low equivalent number does not draw any phone line power. 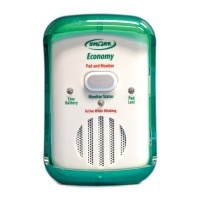 This Smart Caregiver Economy Fall Monitor Alarm functions with bed fall alarm pressure pads, chair fall alarm pressure pads, floor mat fall alarms, or seat belt fall alarms with both an audible and visual alert. 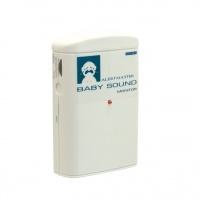 The TL-2100E Economy Fall Monitor can be placed at the bedside or wheelchair, connected to a corded sensor pad. The sensor pad gets placed under the resident. When the resident gets up and pressure is removed from the pad, the monitor will sound alerting the caregiver. Now caregivers have a reliable way to get alerted by a blinking light and adjustable-volume sound if a patient gets out of bed or chair, or moves around. It can be placed out in a hallway so the room stays quiet, and since it's wireless, there are no dangerous cords to trip over or cord tangles to deal with. Perfect for hospitals and nursing homes! 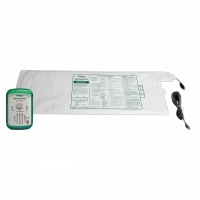 The Wireless CordLess sensor pad by Smart Caregiver gets placed under the resident. When the resident gets up and the pressure is removed from the pad, a wireless signal is sent to the alarm in the hallway alerting the caregiver. Monitor can be mounted away from the bed, removing in room alarm noise. Monitor in hallway can be set quieter. 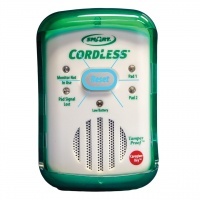 Wireless CordLess fall prevention monitors and sensor pads help to reduce entanglement and tripping hazards. The TL-2100G CordLess Fall Prevention Monitor continually indicates that a signal is being received from pad and the system is in good working order. If pad signal is broken or out of range, monitor alarms and indicates signal is lost. The Cordless Fall Prevention Monitor TL-2100G works with two pads. Use on CordLess monitor with two sensor pads for a safer and more complete resident monitoring environment. NOTE: This monitor will not work on its own. It must be connected to a CordLess Bed Pad, Chair Pad, Floor Mat or PIR-01 Motion Sensor, which will send a signal to the monitor.